Utagawa, Kuniyoshi, An old man and an old woman playing at neck tug-of-war, circa 1850. JWP 31.34 (accession number), SOAS Library. 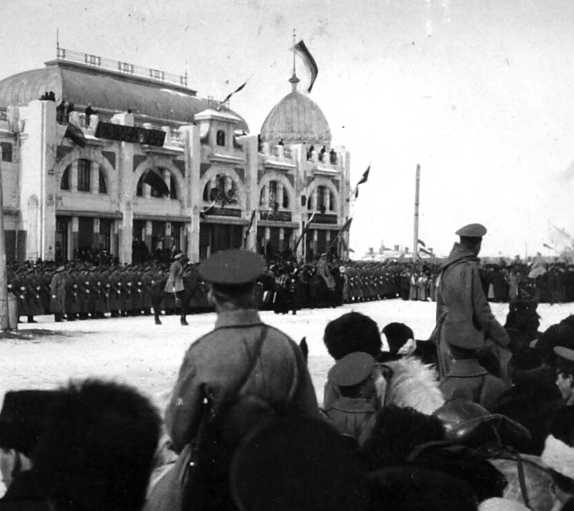 George E. Cormack, Romanov Tercentenary Parade: military columns (distance) formed in front of the G. P. Rofast (Г.П. Рофастъ) Mechanical Gymnasium, 1913. MS 380660/02 (soas manuscript number), SOAS Library. © SOAS University of London. Group of Sinhala adults and children playing, 1960. PP MS 19/6/SING/0087 (SOAS Archives catalog number). Photograph: Christoph von Fürer-Haimendorf. © Nicholas Haimendorf.